"How to Avoid Common Inquiry Response Pitfalls"
I have a fantasy of taking my family on a month long "workcation" during the summer. While on some level, I know it is not likely to happen, I still want to see what vacation rental options are out there. I looked in San Diego, California, and sent inquiries to three listing sites about availability. Surprisingly, I only received one response, and I almost didn't realize it was a legitimate email because I was convinced it was spam. I don't want your rental success to suffer the same fate. Let's take a closer look at the email response to see what went wrong. 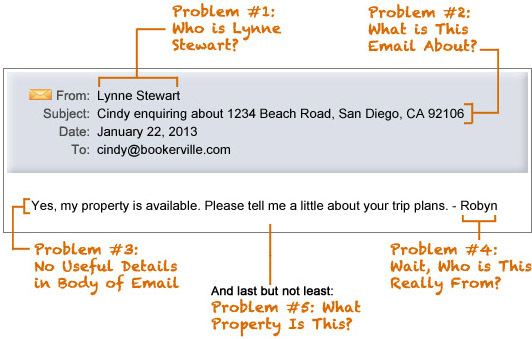 Explain the Who, What, When, Where and Why of the email in the email. Unfamiliar "From" names are a flag to the person reading them. Refer to your property in the email subject; make sure it is the same property name they saw on your website. Provide useful details in the body of the email: who you are, list of property details, how they found you. Don't send your email responses from someone else's account. Problem #1: Who is Lynne Stewart? Put yourself in the client's shoes. Imagine opening up your Inbox to find several unread emails. The first task is to delete all the items that look like trash. Most of the time, we tend to delete anything from whom we don't know. In this particular case, the From name is "Lynne Stewart," which is not a person I recognize. My internal spam alarm starts to ding. On the listing sites that I sent inquiries to, there was no mention of "Lynne Stewart." So, there was no recognition of her name on my part. Problem #2: What is the purpose of this Email? Avoid making assumptions. 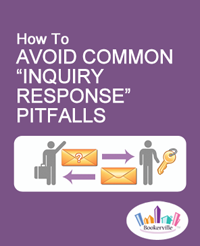 Your client might not realize that your email response is actually an inquiry response. Provide information in the Subject Line that will jog his or her memory. In my situation, several hours had passed since I made the inquiries. Between being busy, getting lots of emails, and the time it took to get the response, I had nearly forgotten about sending the inquiries. This happens to your clients too. "Your client might not realize that your email response is actually an inquiry response." Another reason why my spam alarm is now ding donging and I didn't immediately realize this was an owner response: I've never seen that physical address. On this listing site, the property was listed as "Mission Hills Townhouse: Close to Beaches." The email response does not have either of these pieces of information. There was no mention of "Beach Rd" or "San Diego" on the website, so it is not useful to see it in the Subject Line. I didn't put two and two together and your client might not either. In the sample email, the body text was one line. When I saw this one-liner in the body of the email, I just knew it was spam. DING DONG DING DONG. The body of the email should not be cryptic, nor should it be overly familiar, like you and the client are longtime friends. It should be professional. It should remind the recipient of the address and the dates that were requested. It should provide enough information so that the client can either agree to rent your property, or find alternatives if they are available. Problem #4: Wait, Who is This Really From? The "from" line says it's from Lynne, but the signature is from "Robyn." I'm confused. Who is this from? Why would an owner use someone else's email to communicate? Frankly, the fact that I read the email is pure accident. The ONLY reason why I actually read it was due to the name "Robyn" being familiar to me. I know someone who spells her name this way and I thought this email was from her. Please realize that all this "thinking" happened in a matter of seconds, probably even less, as I scrolled through my Inbox to weed through the "real" emails. "Frankly, the fact that I read the email is pure accident." Fortunately, this owner was lucky to have a name that was familiar to me. That is the ONLY reason I didn't hit Delete before reading it closely. You can increase the likelihood that your emails get read when you consistently match up your email response name to a name mentioned on your listing. Problem #5: What Property Is This? After I slowed down for a moment to actually read the text in the email, I realized this was a response from an owner. Seriously? Wow! But for which property? Like I mentioned, I sent inquiries for three different rentals, from three different listing sites. I had absolutely no way to know which one this was referencing. I was laughing. I was crying. Not for me but for this owner. I am very familiar with this industry, and therefore recognized the email. What if this were the first time I had tried renting a vacation property this way? Would most unseasoned renters find this approach successful and friendly? Eventually, I received answers to all my questions, yet the process was a bit arduous. Several emails went back and forth and the overall experience left much to be desired. Do you want to risk frustrating your potential clients with a similar experience or would you rather communicate effectively enough to get your property booked quickly? Let's look at how we can implement powerful elements into your email responses. 1. Use your real name in your "from" tag in your email and provide this information on your listing so that when your client receives your email, they are less likely to delete the response. 2. 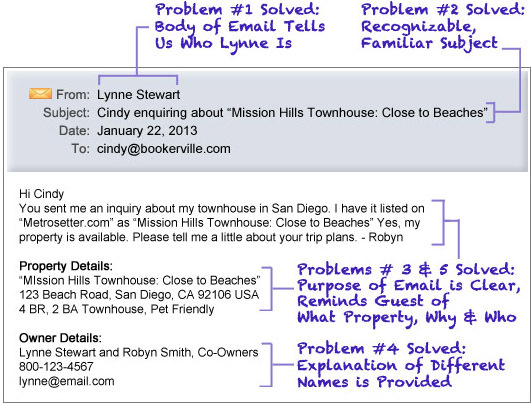 If you have a unique situation (like co-ownership or a third-party answering email), clearly explain it in the email. The last thing you want is for clients to get the impression that you are shady. If your name is not mentioned in the listing site, indicate who you are in the email, like Robyn Smith, Owner of "XYZ Property." 3. The Subject Line should match the name/description of the property THAT WAS SHOWN TO THE GUEST when they first found you. 4. If your property title is listed as, "Fancy 4BR Inches from Beach" then the Subject Line should include: "Availability for Fancy 4BR Inches from Beach." That is how the guest knows you, and that should help them identify the reason for receiving the email. 5. In the body of the email, list the name of the property as it was used in the listing site, and any other clarifying details (like 4BR, 2BA, Oceanfront, Pets Allowed, Single-Family Home in San Diego, CA). This helps the guest recognize why they liked you in the first place. It helps them separate you from all the other owners and rentals competing against you. 6. Extra Special Tip: You could ask for feedback about your emails from actual guests. Consider this quick and pain-free approach: "By the way, tell me if this email is clear or if there is additional information I should provide to help you know who I am?" 1. Be willing to regularly modify your emails. 2. Get feedback from real guests. 3. If you haven't already, try out the Automatic Scheduled Emails and Auto-Responder features of Bookerville. Are you wondering why someone would provide this kind of advice? Do you wonder if clients really think like this? Maybe they do, maybe they don't. The point is that you have at least one property that needs to get rented, you have a lot of competition, and your communication must be effective. If there is a way to communicate that leads to greater success in booking your property, why not implement it and move on? "Can you perform this task?"